This special episode of the Gmail Podcast is a recording of a webmail security presentation I did at DragonCon in Atlanta Georgia on September 3, 2011. I co-presented for the EFF track with my Technorama co-host Kreg Steppe. It’s a little longer than my usual Gmail Podcast. And at times it starts to become a Google support forum, but thanks to Kreg’s facilitation, he gets things back on track. This episode contains many topics discussed on previous episodes of the Gmail Podcast, along with some new information, put together in one package. If you’re looking for better ways to reduce your risk email attacks, then you won’t want to miss this episode. Just a short one today… Some of you may already know this. If you use Gmail from the web browser on your iPad, iPhone, Android, or other mobile device, you might find it a bit annoying to label your messages. When reading a message, use the drop down chevrons on the upper right, select Label, and you are presented with a list of all your labels. Until recently, I would scroll to the label I wanted, check the checkbox, then have to scroll back up to the Apply button. One day I was doing this and for some reason missed the checkbox and just clicked the word “Finance” and it put the label on and went back to the message – much faster than scrolling back up and clicking Apply! 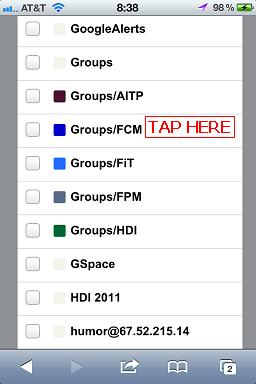 Of course, if you want to apply more than one label, you will need to scroll, tick the appropriate checkboxes, and click Apply, but for just one, tap the label text for a quicker experience. FYI – I’m still here despite the reduced show frequency in the past few weeks. A number of factors have contributed, mainly short notice work related travel, keeping me from producing podcasts as frequently as I would like. My schedule is supposed to get a little less hectic in the coming weeks so look for more shows then. We’ve got great things planned as I move in to my seventh year of podcasting! To start, Gmail has a new feature being rolled out that puts the latest Google Buzz comments from the mail sender on your sidebar. When you open a conversation, look on the left and if the person writes Buzz comments, you will see them there. If you don’t see the option, it could be that the person either doesn’t use Buzz, or that you need to turn this feature on. You can find it under Settings on the Buzz tab just below Your External Apps. If you don’t see the option there, it could be that it hasn’t been released to you yet. Keep watching. Like most features, this is being released in a phased approach. Gmail is currently Google’s biggest application to date. While Buzz has a few million users, it hasn’t lived up to Google’s expectations and still falls far short of being a Twitter of Facebook killer. Google hopes that by making Buzz messages more prominent in the Gmail interface, it will drive more people to use the feature. Next up, I came across a security checklist on Gmail’s help site with 18 steps to help make your computer more secure. The checklist includes everything from keeping the latest software and patches installed to changing your password periodically. I’ll include a link in the show notes so you can make sure you do your part to prevent problems and unwanted access to your computer. I went through it and found a couple things that I could probably do a little better. Thanks Google! On a security note, listener Norb sent along a phishing scam that you might want to look out for. Phishing (with a ph) is a way in which people send fake email messages to try and gain your access information. A typical one would be from someone impersonating PayPal with a link to their site that looks like PayPal to try and get you to login with your account information and bam – they’ve got your PayPal login and password. Bad idea. How do you protect yourself? Watch for key clues. Once you become aware that most services like your bank, eBay, and so on don’t send out messages that say “You’ve won”, or “You need to validate your access”, you can just delete these, or better yet, use the Gmail option to report phishing so it can learn and block these messages so other people don’t receive similar messages. Our science & technology team has recently launched Google web software to protect and secure all Gmail Accounts. This system also enhanced efficient networking and fully supported browser. You need to upgrade to a fully supported browser by filling out the details below for validation purpose and to confirm your details on the new webmaster Central system. Account Name: Pass word: Country: Date of Birth: Note: Your Account will be disabled permanently if you failed to provide the details below within 72hours. Gmail will not be heard responsible for your negligence. The Google web Service. Again, the first giveaway is the grammar. Don’t be taken in by threats of your account being deactivated. Just report it as phishing and go on with the rest of your day. Finally, I wanted to pass on a neat feature that I hadn’t noticed until recently. If you’re a Google Calendar user like me, then you may have noticed that Gmail will put a short alert message in the lower right corner of the screen when an appointment alarm goes off. If you’ve got a browser window open with Google Calendar running, it will fire an alert there and change your browser focus to that window. However, if you only running Gmail, then you’ll get a little alert in the lower right with the name of the event, the calendar it is from, and two links; one to view the appointment in your calendar and the other to close the short alert message. This is far less annoying than Google calendar hijacking your browser and forcing you to look at the appointment in the middle of typing something! 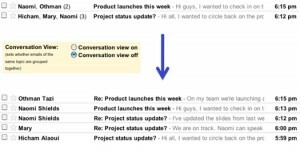 Today Google announced that you can now disable the conversation mode in Gmail. This is huge news. Many people dislike the feature (and I’m being polite when I say that.) That segment can now be silenced and enjoy all the features Gmail has to offer. I am preparing a Gmail Podcast on the subject as soon as I can. I am currently waiting for the feature to be turned on for my account so I can answer a few questions first. I want to bring you more than just the press release – I’ll get you the real story of how G-stuff works. Be patient. George Starcher joins me to share his real life experience with Google’s new security feature. Brought to you by GotoAssist. Try it free for 30 days. In the previous episode of the Gmail Podcast, I mentioned that Google has a two factor authentication available to keep your login information more secure than just using a password. Shortly after I released that, I got an email from my friend and fellow Friends In Tech member, George Starcher to discuss his first week of experience after working with the new security method in his day job. This week there were several news announcements in the Gmail space that I want to share with you. First, Google is rolling out two factor authentication to make using Gmail and other Google apps more secure. Two factor authentication uses your password, something you already know, with a second, temporary passcode issued to you via your phone. That means if someone gets your password, they still won’t be able to get in unless they have your phone. When you sign in to Gmail, you’ll provide your password, then Google will text your phone with a unique six digit code that you then type in to complete the login process. While this double password may seem like a hassle, I’ve used several two factor schemes in my day job and it really isn’t a big deal to use. However, it is a big deal to someone trying to get at your information. The feature is being deployed in commercial and educational spaces first and will be rolled out to the rest of us shortly. No news if the feature can be disabled or not. Keep tuned in to the Gmail Podcast for updates. The second update is that Google has updated their Gmail app for Android. They made the message navigation a bit easier and even have limited support for the new Priority Inbox. And speaking of Priority Inbox, I noticed under Settings, Priority Inbox, that there’s a fourth section you can enable or even change the behavior of the three default sections of Important and Unread, Starred, and Everything Else. As I’ve mentioned in some episodes a while back, I am a practitioner of David Allen’s Getting Things Done methodology. There are times when I need to tag actionable items in email, but they’re not going to be there long enough to enter and track in my system so I label them with @Actions. I’ve told Gmail to use that fourth section for all tasks labeled @Actions. Before Priority Inbox came along, I would occasionally lose items with that label if I happened to archive them. Sure, they’d still have the @Actions label, but they wouldn’t be in the inbox any more. Priority Inbox doesn’t do that. If there are any messages with that label, they’ll be on that front page even if they’ve been archived. That means actions can’t get swept under the rug (or marked completed) until I remove that special label. You could do the same thing with Stars, but I prefer to label things. To make a long story short, the study was sponsored by Microsoft and represented six test subjects. So much for independent studies. 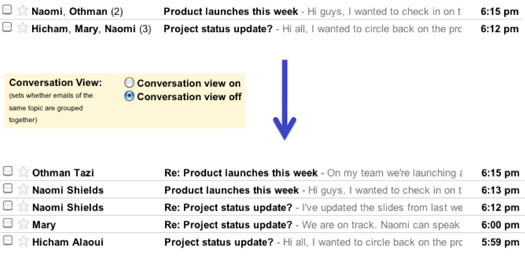 Gmail is attempting to make your email easier to sort through by releasing a feature called Priority Inbox. I have to admit, at first I was skeptical of how this feature would work since I’m one of those people who generally keep their inbox to 10 items or less. A few times a day I go through my inbox and archive the reference information, delete the things I don’t want to see again, take action on the quick items, and mark the other actions for later action. That seems to work fairly well. “What value do I get with Google guessing at the importance of my incoming messages?” was my first thought. Let me back up a bit. When your account is enabled with this feature, you will see a red message in the upper right by your login name indicating Priority Inbox has been turned on. 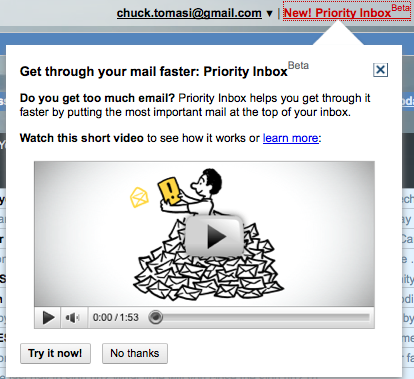 If you like, there is a short video in the pop up window that helps explain the benefits of priority inbox. Click the “Try it now” button in that same pop up window. Once enabled, Gmail does a few things. First, it creates a new link on the left called Priority Inbox. The regular Inbox is still available just below that link. Second, it goes through your mail and makes some guesses at what mail is important to you and labels them as Important. Finally, the conversation index is divided in to four sections. By default, three of these are turned on. They are for messages labeled Important, Starred, and Everything Else. You can change these and even add a fourth section by going in the Settings under the Priority Inbox tab. You can also tweak a few of the other priority inbox settings from that same screen including the option to not show the priority inbox at all. Like spam filters, the priority inbox needs to learn what’s important to you. Gmail has one of the best spam filters around and it’s these same methods that help learn and identify important email as well. If it gets something wrong, you can use the new + and – tags on the button bar just above the conversation index to help it get smarter. After only a few days and a few keystrokes, I’m noticing a marked improvement. It is possible to abuse the priority inbox if you mark too many things important. What does “important” mean? That’s up to you. If you mark too many things important and find that 95% of all of your email is ending up in the Important section, then it has lost its value. One other thing about priority inbox, I noticed that the shortcut keys g-i take you back to the priority inbox if you have it enabled. There doesn’t appear to be a shortcut for the standard inbox while priority inbox is around, but if you find one, let me know about it. One final note, Google Voice has added email notifications for missed calls. This is not so much a quick tip, but an FYI . While this isn’t terribly useful for people with Android phones who see the missed call on their handset, it is nice if you are on your desktop where you can have the missed calls noted in your Google Voice inbox or emailed to you.